I think this card is from the early 20s. 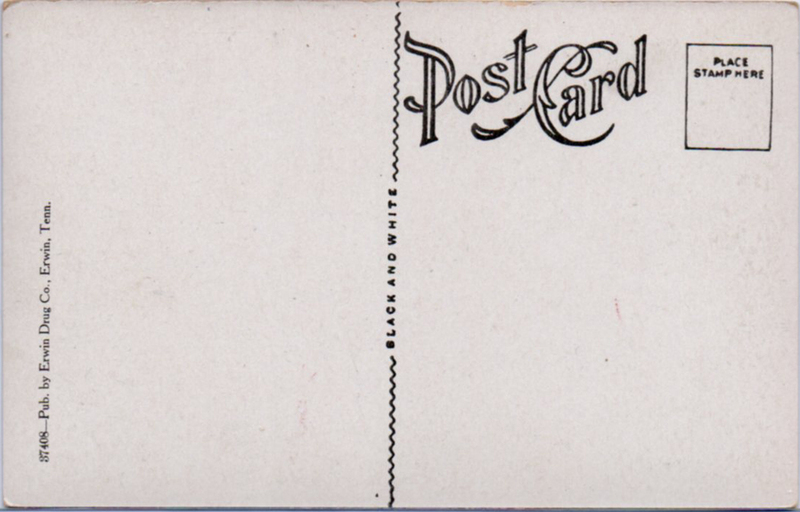 I don’t know what company actually printed it (“published by Erwin Drug” just means that the drug store commissioned the postcard run). American News Company of Boston farmed out a lot of the black-and-white work to Curt Teich in Chicago. The inventory number does seem to indicate ANC. However, I’m still working on this. 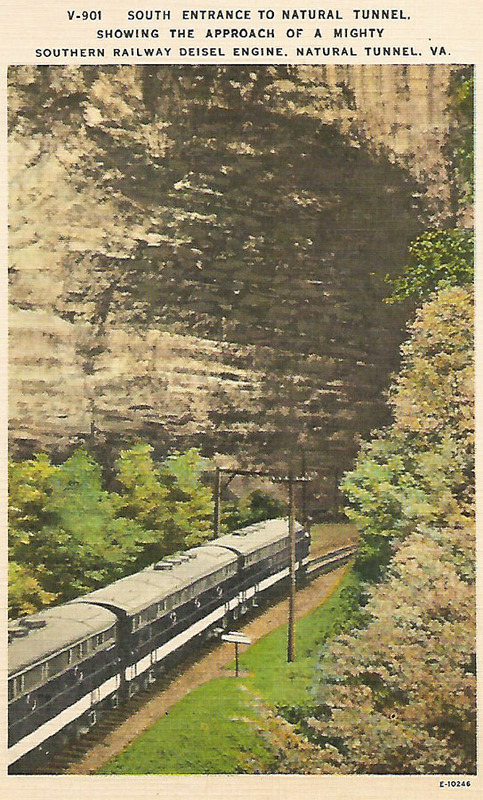 I have several cards in my collection that have the same back design and one seems to indicate it was done by Asheville Post Card Company. Another maybe: this design often is shown with “COMMERCIALCHROME” AND “OCTOCHROME” in place of the “BLACK AND WHITE” wording. It gets complicated. Whatever. 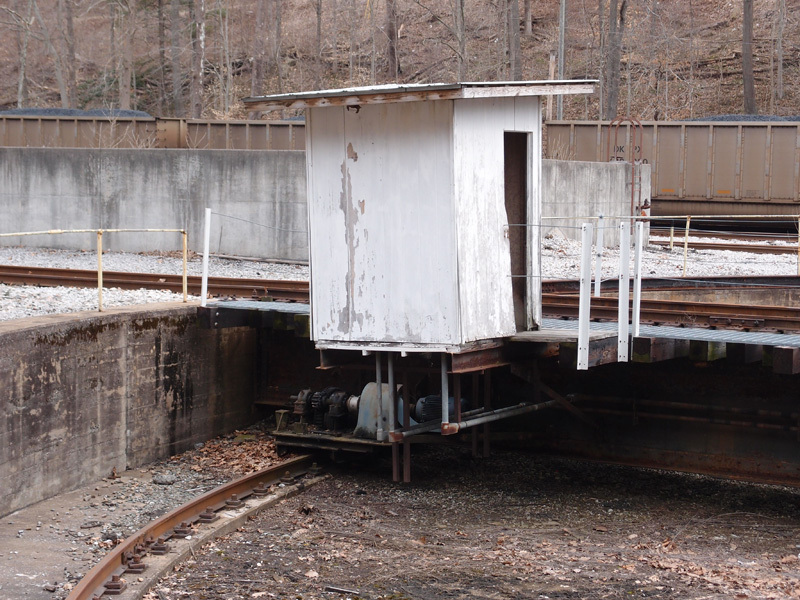 This bridge was a replacement for an earlier timber structure and is, according to Goforth, is a TPG, a through plate girder style built on stone piers (possible: Goforth had access to original construction data and may have been using the TPG abbreviation to mean “timber plate girder”). It’s 864′ long. This view is looking back toward Erwin. 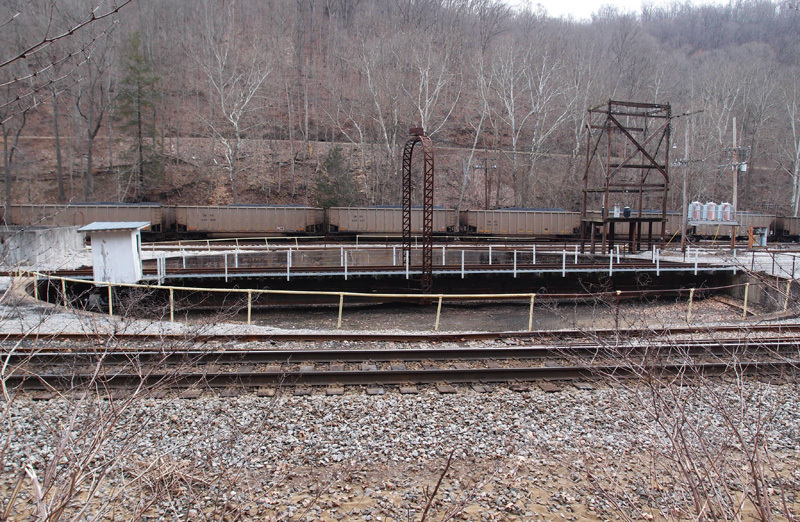 Note the steps up to the railroad grade. The bridge is now a through pony plate girder and the piers are still there, but have been added on to in order to raise the level of the track. 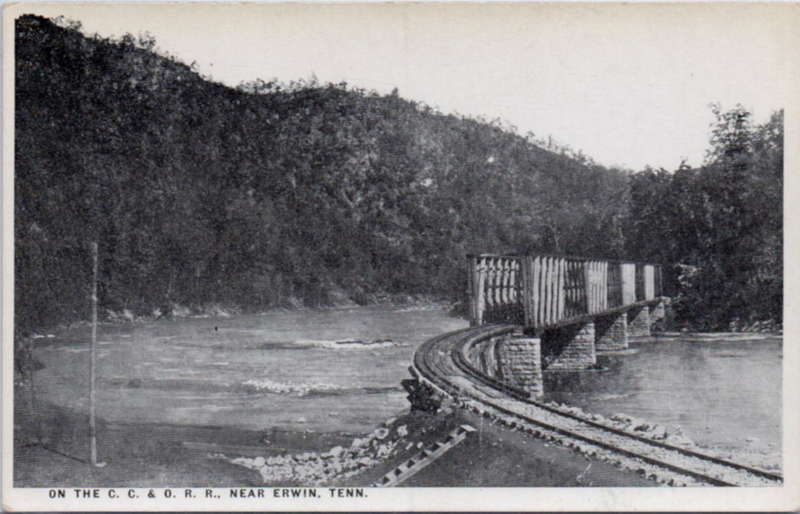 There are houses on the left of this,at Unaka Springs, but no stairs. I’m looking southeast down Highway 38. 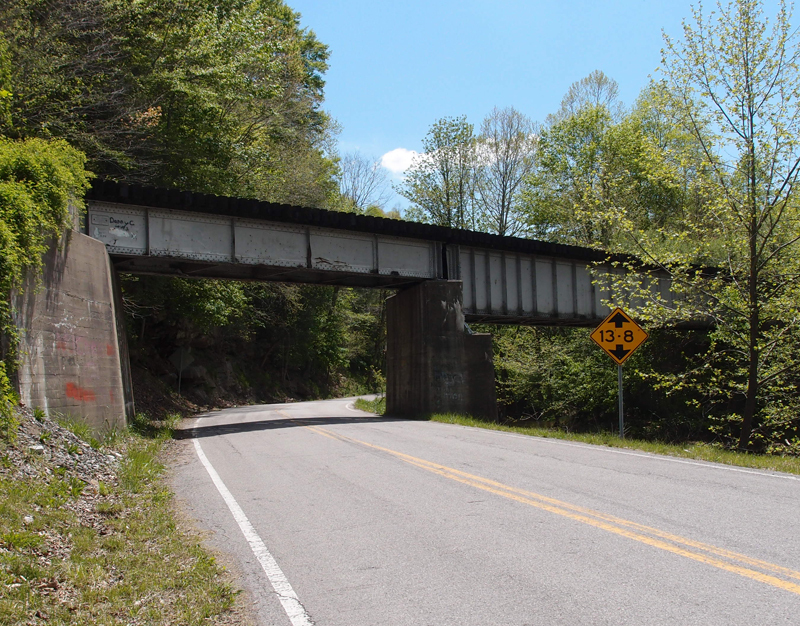 Days Creek is on the right, under the extended part of this deck girder that once served the old Clover Branch of the Clinchfield Railroad. The date plate is right about where that white spot is (the white is paint that covered over whomever Danny C loved at one time). 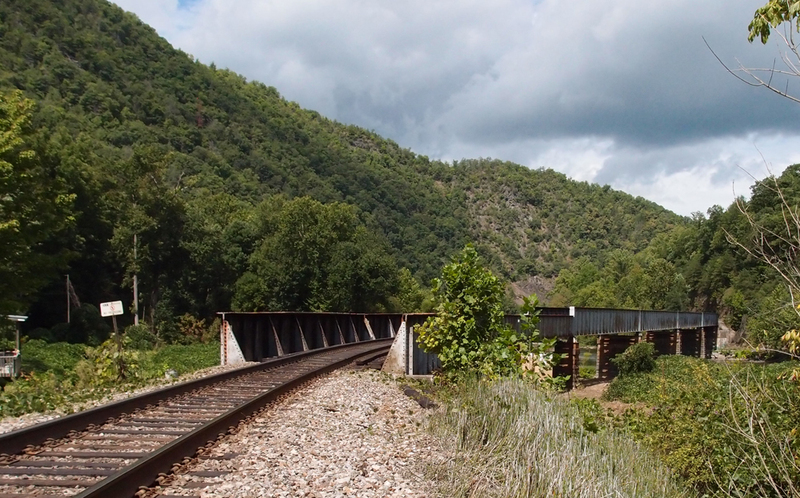 This is a Virginia Bridge & Iron structure made in Roanoke in 1948. Holmes Mill is about .64 mile down this road. There’s a currently out-of-use coal sorting plant behind me. If I had backed up a little bit and turned around to take a shot, you’d see two conveyors coming down to the plant. You can see it on Google Earth 36.87884, -83.01097. 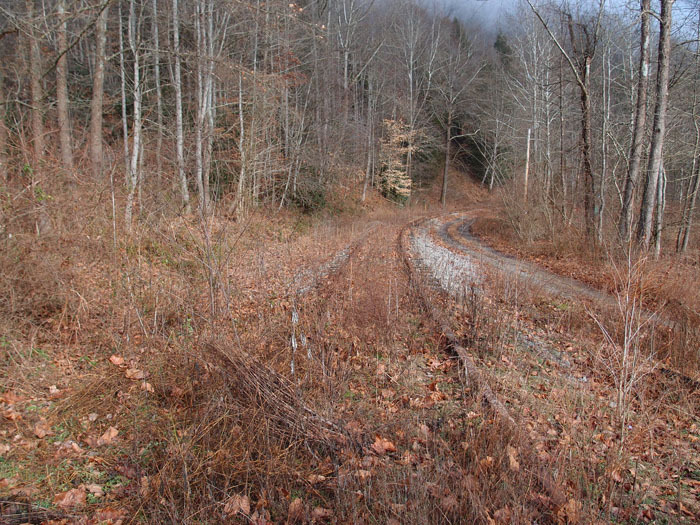 A person who follows this blog queried me on a tunnel he’d found access to of Hwy. 83 in Dickenson County VA. I searched it out and found what it was, but I couldn’t find a blog entry about it. I’d slipped up. I thank the guy who caught this. 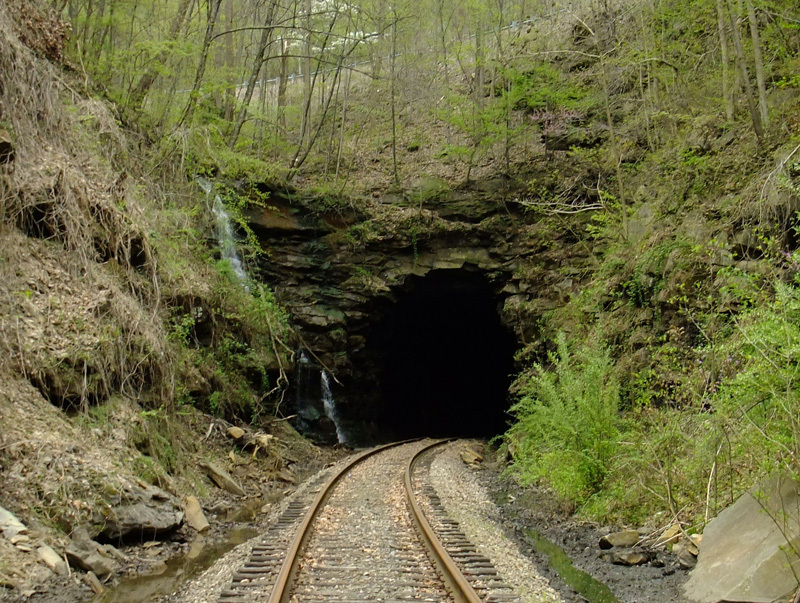 This is Bear Pen Gap tunnel, west portal, taken in April, 2011. In my original digital photograph, the east portal is just barely visible at 1/2 mile away. Returning to this portal today, May 24, 2015, I couldn’t see the other portal. Part of the tunnel may have collapsed. Very dangerous. The air coming out of this tunnel today was cool enough to condense breath. This is the east portal, taken in April, 2011. The water, as of May, 2015, was still flowing off the left side ledge. This portal is a little over a half mile from Fremont. 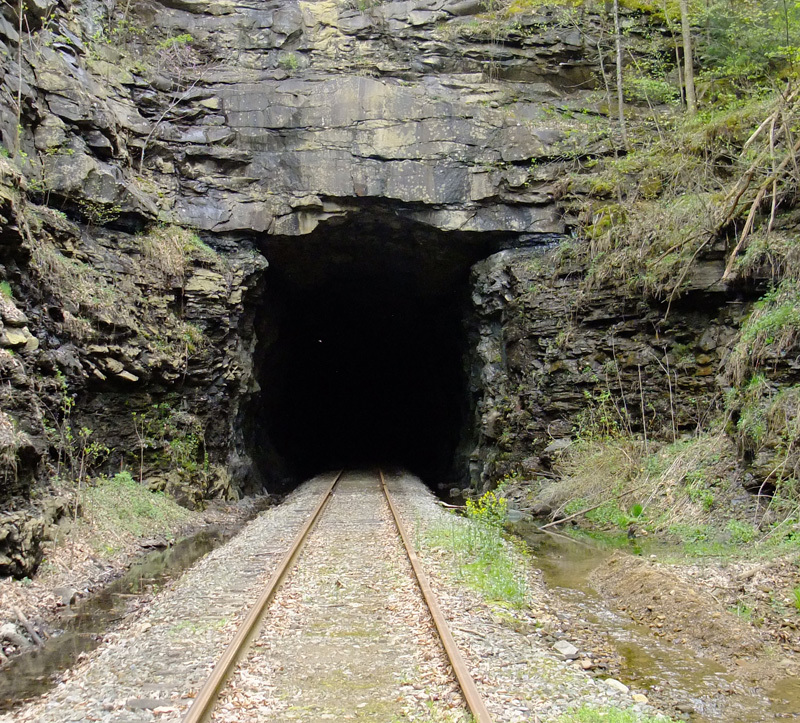 This was the one tunnel on the Clinchfield Railroad’s old Fremont branch, which, starting in 1947, ran from Fremont to Moss #1 mine a little over 14 miles away. The mine shut down in 1989, but this line was used for a couple more years hauling wood chips from an operation at the Moss location. The latest rail date we saw in this area is 1972, Lackawanna. As we walked up to this portal four years ago, a kid (may 13-14 years old?) came down the embankment. He was totally togged out in Army fatigues – cap to boots – and was sporting a fake pistol in a proper holster. We all nodded to each other and passed on, but my buddy and I exchanged a puzzled look. Cosplay is everywhere. Note: a bear “pen” is a place where early settlers trapped bears and killed them for meat. I finally got back to Dante Yard to take a few pictures of the long-disused turntable. I had to clamber (and believe me, I clambered) up a hillside on the far side of the turntable to try to get the whole thing in frame. I didn’t quite, but I got most of it. Using a turntable like this saved a lot of time when you needed to get a locomotive (all 100 tons or so of it) turned around. I wonder if it was good to have the title of “the guy who runs the turntable”? This is over in Unicoi County. He’s pulling empty hoppers, so he’s headed north. When I was doing the tunnels on the old Clinchfield for this website, I paid close attention to these mile markers, since Goforth has the tunnels noted that way in his book. 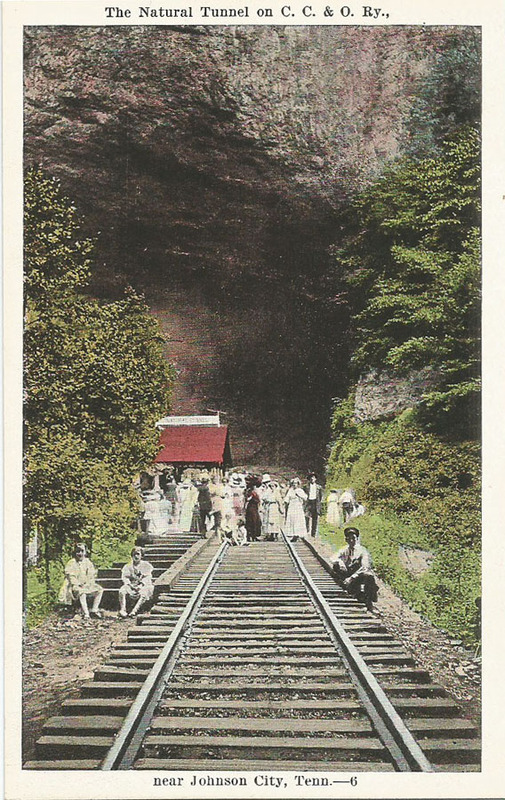 These are both early shots of Natural Tunnel, near Duffield (sort of) in Virginia. This first one is an E.C. Kropp (Milwaukee) card. These people are obviously celebrating something. The sign on the red-topped building reads “Natural Tunnel”. There are no power poles visible. I would guess that the original picture (it was in black and white; the color was added at the printing company) dates to the first quarter of the 20th century. Note that the railroad is listed as “C.C. & O”. Note that there are now power poles through the tunnel. 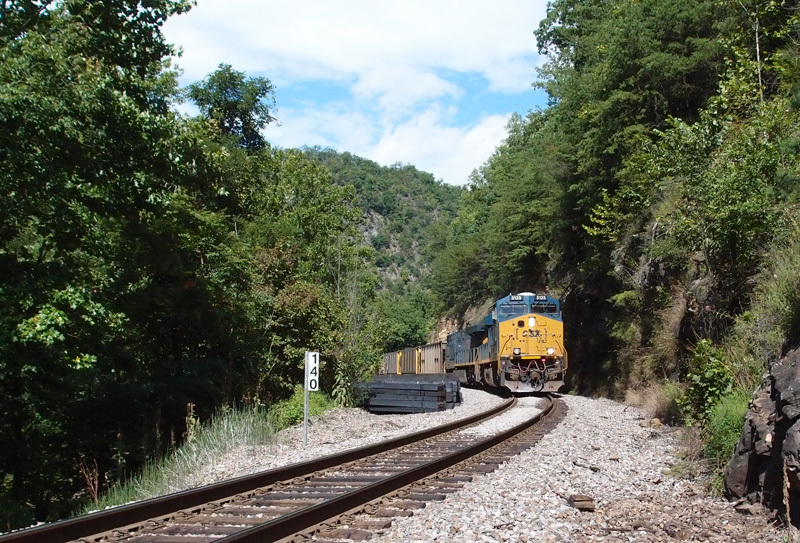 The information about the important Clinchfield Railroad Nora spur is here. Here’s what part of it looked like a couple of years ago. This is near Nora and looking south. 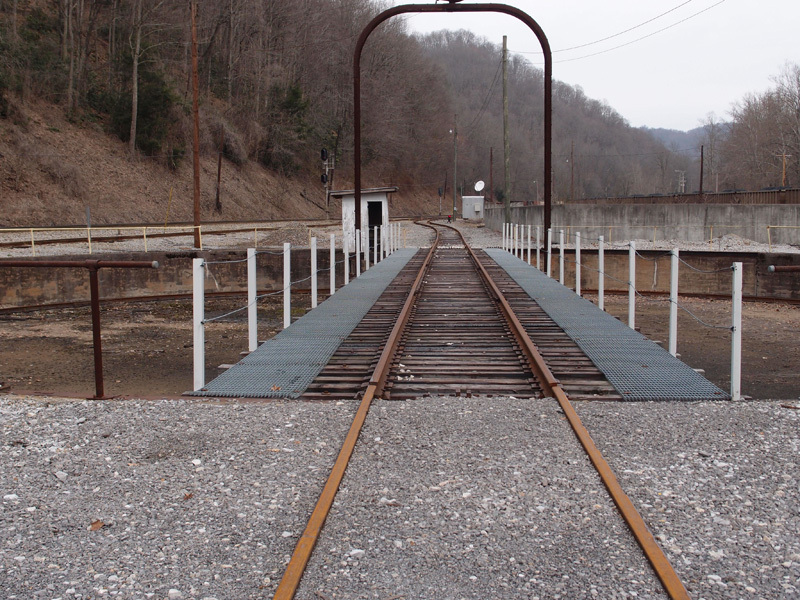 I found two dates on the rails in this section: 1926 (Carnegie Steel) and 1949 (Tennessee). These three are real photo postcards; that is, one-off postcards made by Kodak from negatives sent in by camera owners. The photo of the N&W hopper and the two crew cars can be dated to between 1904 and 1918, as can the shot of the steam locomotive. The one of the crane resetting a CC&O derailment is from the 1918-1930 period. There is no other identifying information on any of these cards. I think they’re fascinating and I snapped them up as soon as I saw them.